Exercise: Shutter Speed | Stop Shooting Auto! In this exercise, we will take several pictures to illustrate how shutter speed affects the resulting image. We’re not going to take any great pictures here, but the ones we do shoot should help us get a better feel for the nuts and bolts with shutter speed. You’ll need a friend with a flashlight, or some sort of light source that he can swing around. In my pictures I used a glow poi (basically an LED on a string) but you can just ask your friend to hold the light in his hand and move it around. You’ll also need a camera, of course, and a not-too-bright room. Oh, yes, one other thing. You’ll also need a beer or other Appealing Beverage to thank your friend for the help. If you know someone who wants to learn to use his dSLR better as well, the two of you can take turns being the photographer and the helper. If you have a tripod, it will be useful for this exercise. Instead of holding the camera when I tell you to, put it on the tripod. If you don’t have a tripod that’s OK… blurry pictures won’t be a big problem. If you really want the shots to be perfect, find a table or something to brace the camera on when you take the photos. Set up your camera: To begin, set your camera to ISO 400 (if you now how… if not, don’t worry about it), shutter priority mode, and manual focus. Have your friend stand facing you. Pick a spot that will let you get his upper body in the frame plus a couple of feet on either side, and manually focus the camera on him. Focus doesn’t have to be perfect, but it should be good enough to get the light source pretty clearly. 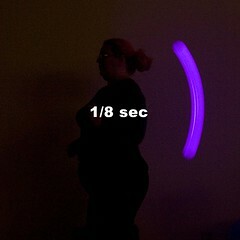 Set your shutter speed to one second. On my Canon that’s the number one with two tick marks after it. Now, ask your friend to turn on the flashlight, point it at you, and start moving it in a circle in front of him. Ideally he should be doing this so that he makes one circle every second, but friends are unpredictable (especially if he’s already had that beer) so any speed that’s somewhere in that vicinity will work. Holding the camera as steady as you can, take a picture. Yes, it’s a one-second exposure and you’re going to shake, but that’s OK. We really just care about how far the light moved. One second sure is a long time, isn’t it? When you’re done, check out the picture on the camera’s display, and you should see a circle of light. 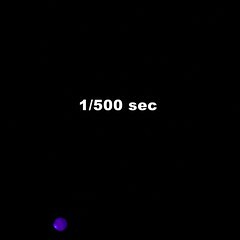 Now, set the shutter speed to 1/2 second (indicated by 0”5 on my Canon), ask your friend to make a light circle again, and take another picture. Repeat this for 1/4, 1/8, 1/30, 1/125, 1/250, and 1/500 second. When you’re done with this, you’ll wind up with a set of photos of progressively smaller arcs of a circle of light. At 1 second, you should basically have a full circle. Half a second should get you approximately half a circle of light, and so on until you get to the very fast exposures. Look closely at the ones that are 1/125, 1/250, and 1/500 of a second. When I did this exercise, 1/500 pretty much froze the action, but 1/250 and slower had blurs of light. When I did this exercise to create sample images, I put the camera on a tripod and used a remote shutter release rather than asking a friend to help. As I mentioned earlier, I also used a glowing ball on a string rather than flashlight. Still, the resulting images do a pretty good job of showing movement. I have them all in my photography class set on Flickr, and they’re tagged “light circle exercise”. Note that some of your photos may have come out much brighter than others. That’s OK! What happened was that your camera wanted to make all of the pictures bright and shiny and happy at whatever shutter speed you chose. At the slower shutter speeds it probably closed the aperture down to block out some of the light. As you chose faster and faster shutter speeds, the camera opened up the lens to let more light in but at some point it ran out of room to do this because the lens was already as wide as it would go. When that happened, the camera just did its best but the photos started getting darker as the shutter speed got faster. For the purposes of this exercise that’s perfectly OK. In fact, it’s a good way to see how your camera’s photos turn out when the camera is starved for light. When you’ve completed this exercise, you should have a bunch of pictures with streaks of light in them. The Guggenheim won’t be beating a path to your door over them, but you’ll have practiced setting your camera’s shutter speed to a pretty wide range of settings, and you’ll have a pretty good understanding of how much motion there is at a specific speed. Oh, yes. 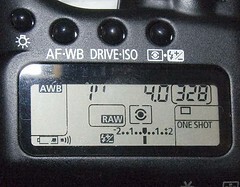 Set your camera back to whatever ISO (probably 100) you usually use, and set the lens back to autofocus. That will save you from some confusion the next time you try to use the camera. In general, it’s a good idea to pick a set of “normal” settings for your camera and leave the camera in that configuratoin whenever you put it away. That way, if you want to pick it up and shoot something quickly you won’t have to worry about undoing whatever you did last week. If you want to practice some more, find some other moving object and start taking pictures of it. If you have dogs or small children, you can probably persuade them to run around in the park while you take pictures. Cars, water, anything that moves somewhat predictably will be good practice for you. If you want to share your photos from this exercise, I recommend uploading them to Flickr and tagging them with “stopshootingauto” and “lightcircleexercise” so that other people can see them just by looking for those tags. Still reading… love the simplicity of explaining stuff and u do have a great senzse of humor!! !